Are bills going unpaid, or paid multiple times? Is mail stacking up? Are tax returns late or incomplete? Are insurance benefits going underutilized? Is your loved one vulnerable to fraud? Care is There can help! Our Daily Money Managers will work with you to design processes that will keep paperwork organized, ensure vital tasks are performed accurately and on time, and the chances of fraud are minimized – while utilizing your loved one’s strengths and maximizing their independence. 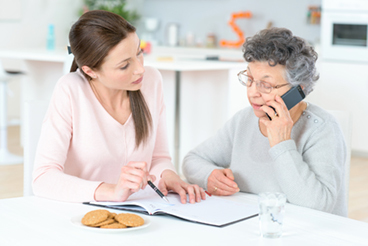 Contact us today for a free consultation about how our independent living support can bring you peace of mind.